Urine marking is a territorial behavior in cats. If you own a cat, the last thing you want to see when you move to a new home is that your mischief maker just sprayed your bedroom wall. Moving is a very stressful and strange experience for most felines, and as a result is likely to cause icky spraying. Both male and female cats mark due to the desire to mate. If your pets aren't neutered or spayed, you can try to put an end to the marking by shutting doors and covering all windows in your new home. 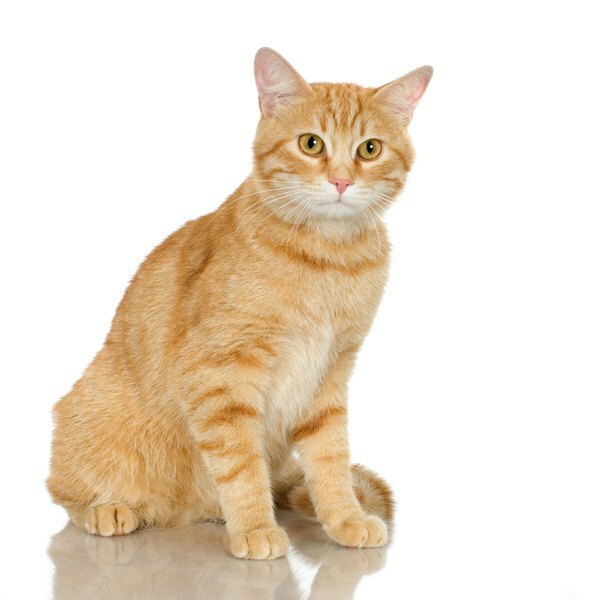 If your cat isn't distracted by the sight of other felines -- whether the cat next door or a stray -- he won't have the urge to "alert" them of his availability. At the very least, the urine marking behavior should calm down, much to your wallpaper's joy! Many cats start spraying urine out of pure dissatisfaction with the litter box. If you don't clean your cat's box out frequently, he may protest by flat-out refusing to use it. Cats are known for cleanliness, and it's up to you to respect that. Your furry pal may also be unsatisfied with the cramped quarters of the litter box, or perhaps the embarrassing living room location in the new house. Cats are very private and discreet when it comes to bathroom matters! Think about your pet's litter box situation and what about it may be bothering him, then make the appropriate change. If your cat has developed a penchant for spraying in basements, for example, try to naturally stop the situation by closing off -- at least temporarily -- his basement rights in the new place. When doing this is unrealistic, come up with other ways to make the general area unattractive to him. Maybe place a bowl of very fragrant potpourri smack dab in the middle of the basement. Your cat's nose will probably have him running in the opposite direction in no time! Moving is a major source of stress in cats. Our furry friends simply don't react well to change. Routine is a cat's best friend! Your cat may respond to the stress and anxiety of the unfamiliarity of a new home by spraying -- much to your dismay. Get your pet's mind off the stress of the new situation by giving him lots of love and attention, whether through play time or snuggling together. Also consider getting him some interactive, stimulating toys to get his mind off the confusing new surroundings -- think toy mice or laser pointers. With some time and distraction, your kitty's nervous marking behavior may cease -- naturally. In a new house, a cat may go crazy spraying trying to remove the scent of the previous owners -- and their pets! If this is the case with your fluffball, take matters into your own hands and go on a rigorous cleansing spree of the whole place, from the attic to the basement.